The name of Creusa is given to several female figures in Greek mythology, although it is Creusa, wife of Aeneas, who is best known. ​This Creusa was a mortal princess, for she was a daughter of King Priam of Troy, and his second wife Hecabe; as Priam was known for his many children, Creusa had many famous siblings, including the likes of Hector and Paris. When of age, Creusa would marry Aeneas, son of Anchises, and descendant of Ilus, the founder of the city of Troy; a suitable marriage, considering the royal parentage of Creusa. Creusa would give birth to Aeneas’ son, a son who is commonly called Acanius, but is perhaps best known by an alternative name, Iulus; for Iulus would give his name to a family line that Julius Caesar was a member of. ​In Greek mythology, Aeneas was a prominent defender of Troy during the Trojan War, but Creusa comes to the fore only during the Sacking of Troy. In one version of the Sacking of Troy, it was Aeneas and his men who were the only ones who were able to defend against the Achaeans who were taking the city. Defending the citadel, Aeneas’ efforts allowed many citizens of the city to escape, but eventually Aeneas realised that all was lost and decided now was the time for he and his family to depart as well. Aeneas’ father Anchises though refused to leave, and rather than leave him behind, Aeneas decides to fight on until he was killed. This was perhaps a noble sentiment, but Creusa would grab hold of Aeneas’ legs to prevent him returning to the fight, and Creusa would implore her husband to think of his duty to her and their son. This is of course similar to the pleadings made by Andromache to her husband Hector. ​Aeneas, in the end did not have to choose between Anchises and Creusa though, for a sign from the gods told Anchises that he must leave Troy. So Aeneas thus departs from the burning Troy, carrying Anchises on his back, and holding Ascanius by his hand; Creusa follows on behind. 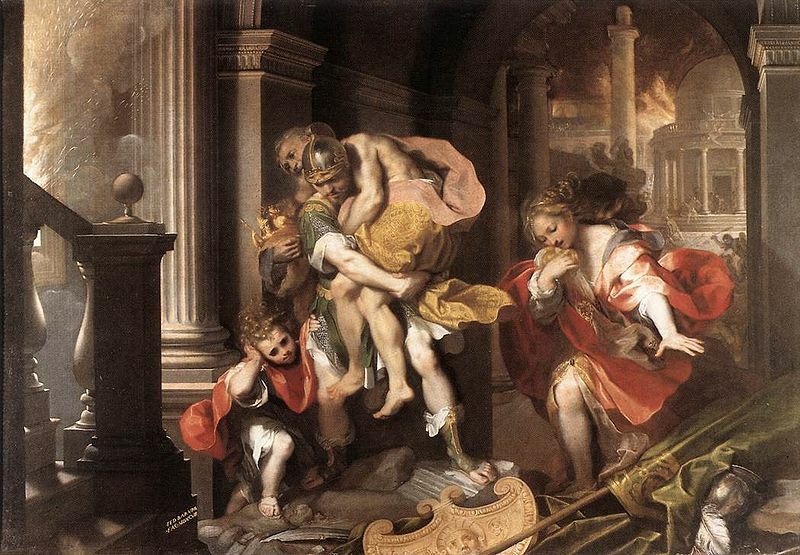 The speed at which Aeneas moves sees Creusa falling further and further behind, and by the time Aeneas reaches safety outside of Troy, Creusa is no longer with the group. Aeneas returns alone to the burning Troy to seek out Creusa, but the search is fruitless until he meets the ghost of Creusa, who has been allowed to return from the Underworld to speak to her husband. Creusa tells her husband of much that is to come, and asks that he takes good care of Ascanius. Aeneas tries to grab hold of Creusa, but she disappears, presumably back to the Underworld. 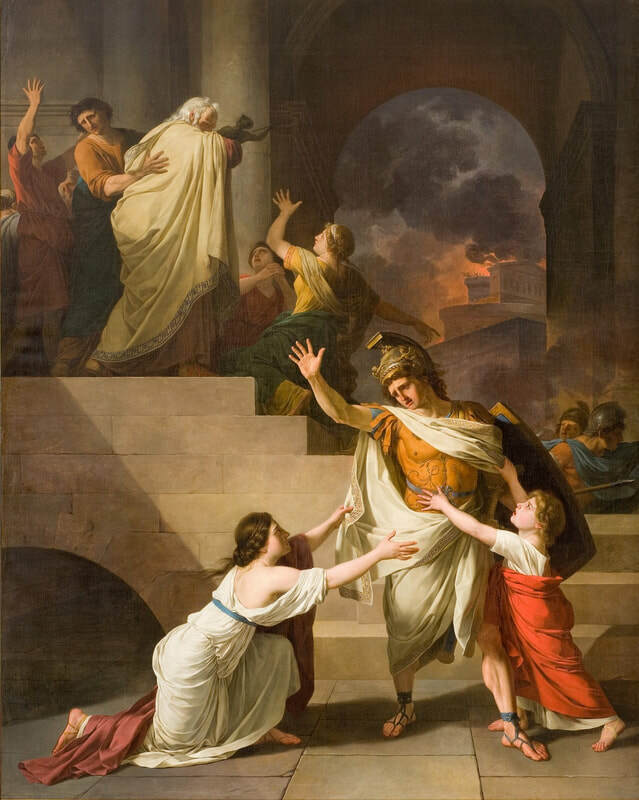 This is the tale told by Virgil, in the Aeneid, but this leaves lots of questions of how Creusa came to die, who buried her, and who allowed her to return to speak to Aeneas. Some writers therefore tell that Creusa was not killed in the Sacking of Troy, but was instead rescued by the goddess Aphrodite, Creusa’ mother in law, and so it was not the ghost of Creusa that Aeneas spoke to, but a divine manifestation of some sort, arranged by Aphrodite.